Werribee Railway Station was completed in 1857 as part of the Geelong and Melbourne Railway, the first country railway in Australia. The station was designed either by architect and engineer Edward Snell, the railway's engineer or by his partner Ferdinand Kawerau, the company's principal architect. It was originally built in bluestone with sandstone quoins. In 1927 it was gutted by fire and a somewhat reduced building, with a low pitched, hipped, tiled roof and cement rendering, was the result. In 1970 the awning (of 1927) was partially demolished by a derailed wheat train. The building is mostly unused. Although there have been substantial alterations, much of the station's original fabric, including walls, part of the bluestone platform, and an unusual cellar, are still clearly discernible. 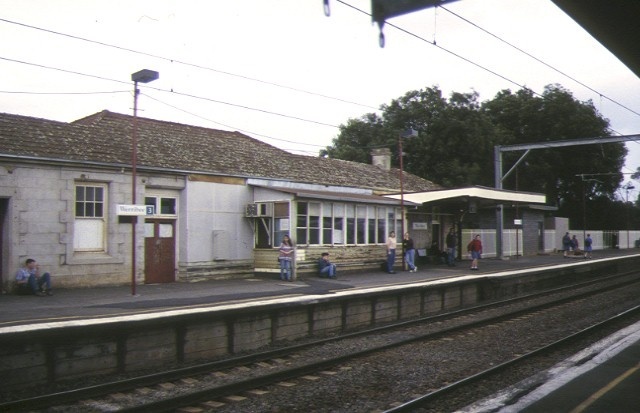 Werribee Railway Station is of historical and architectural importance to the State of Victoria. Werribee Railway Station shares with the St Kilda railway station, also of 1857, the historical importance of being the oldest railway buildings in Victoria and among the oldest in Australia as well as being the last remaining fabric from the private railway era before the formation of the Victorian Railways. It is important for its associations with the Geelong and Melbourne Railway, Australia's first country railway, which was conceived in 1853 by a private company in Geelong, completed in 1857 and taken over by the colonial government in 1860. It is historically important for its links with the development of Werribee and the surrounding district. Werribee Railway Station is of architectural and historical importance for its associations with the architects Edward Snell and Ferdinand Kawerau who were active in Geelong in the mid to late 1850s. Although altered by partial demolition and by replacement of the roof, the building still shows remnants of the styling used extensively by both architects. 1. 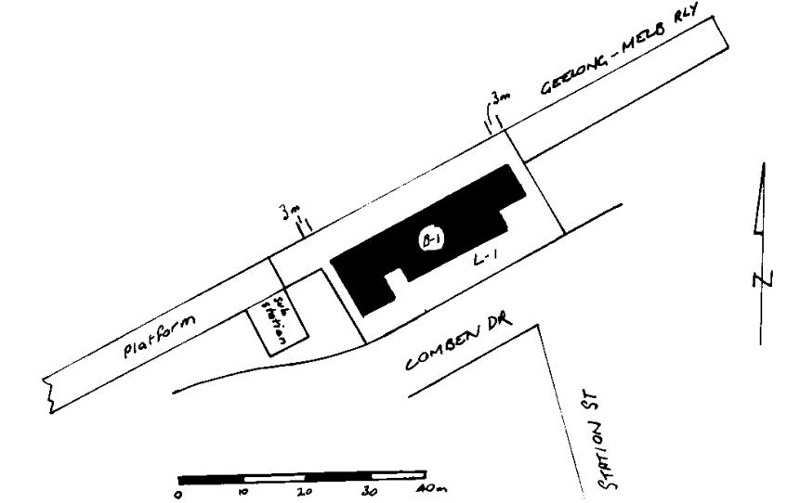 All of the building known as Werribee Railway Station (1857 building and part of platform) marked B-1 on Diagram 601593 held by the Executive Director of the Heritage Council. 2. All of the land marked L-1 on Diagram 601593 held by the Executive Director of the Heritage Council, being part of the and described in Certificate of Title Volume 9489 Folio 166. The Werribee Railway Station was built as an integral part of the Geelong-Melbourne Railway which was begun in 1853 and opened in 1857. It was the first country railway in Australia and was constructed at the same time as the earlier Port Melbourne and St Kilda lines but took longer to complete. It was built, as were all railways in this early period, by a private company, but with government support and encouragement. The Melbourne-Mt Alexander line was the first of these companies to be taken over by government and completed. By 1860 all railways, including the Geelong line, were being operated by the government. 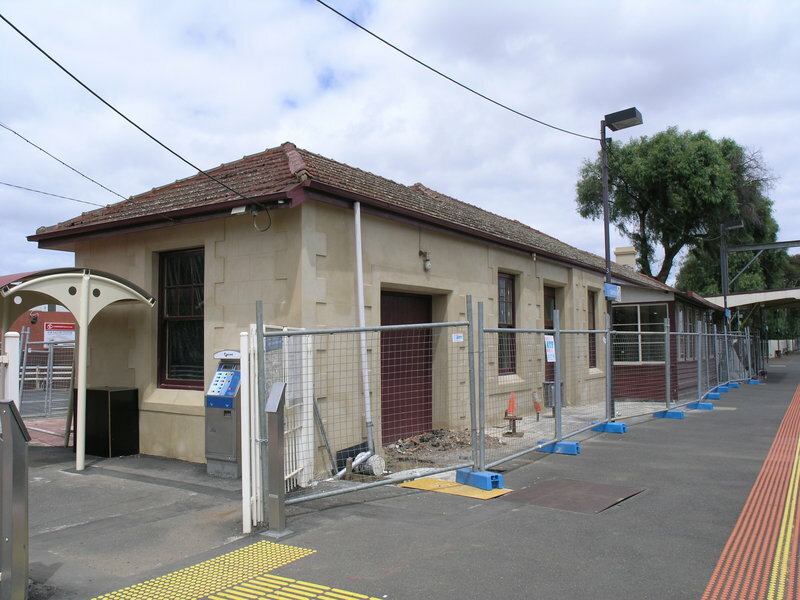 The Werribee Railway Station is an original component of the Geelong line and was probably completed in 1857. The station was a “crossing station” where trains from Melbourne and Geelong met and could pass each other on the otherwise single line. Andrew Ward attributes the design of the building to Edward Snell, the engineer of the Geelong line. Certainly there are similarities with other Snell works in the Gothic style. Snell’s partner in private practice in 1853-54 was Frederick Ferdinand (Fritz) Kawerau who also designed in the Gothic style, and as he was the Geelong railway’s architect while Snell was the engineer, the design of the station building may well be Kawerau’s. The station shows stylistic similarities with Snell’s own house which was “put up in a rascally manner under the superintendence of Kawerau” in late 1854 after their private partnership had been dissolved. The house was next door to Kawerau’s whimsical Swiss cottage. The station building was gutted by fire in 1927. It was subsequently rebuilt with a tiled, low pitched, hipped roof. The bluestone ashlars and sandstone quoins were cement rendered and a 1920s style cantilevered station awning added. In 1979 a derailment of a wheat train demolished most of the awning. The building has been disused for many years. Completed in 1857 as part of the Geelong and Melbourne Railway, Australia's first country railway, this is one of Victoria's oldest railway buildings. Although damaged by fire in 1927 it retains its original walls, platform and cellar.